Don't you wanna look more professional to your email correspondents? 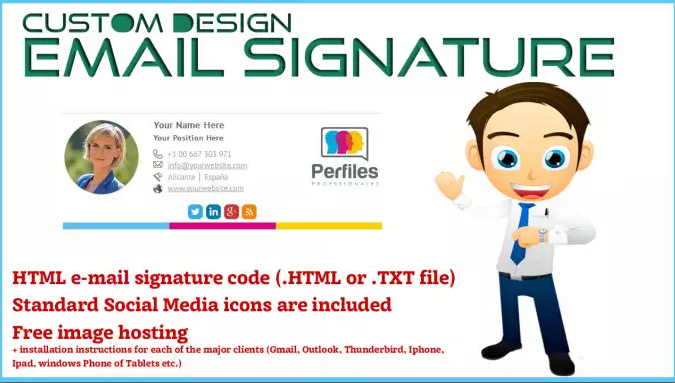 Then, have an HTML email signature that can be installed on yourGmail, Office365, Outlook,Yahoo, Mac mail, iPhone etc. Your portrait and/or logo embedded. I will suggest you 10+ Sample with your details and 1000+ sample to chose which design you like most. 5+ Html Responsive EXCLUSIVELY Email Signature is ranked 5 out of 5. Based on 2 user reviews.